IT'S TIME FOR CYBILS NOMINATIONS! OK, it's officially October. And one of the best things about October is the CYBILS nominations. You know what I'm talking about, don't you? The CYBILS are awards given by bloggers, teachers, librarians, moms, basically anyone who cares about books. There are, I think, nine different categories-- e.g. picture books, nonfiction picture books, intermediate grade novels, Middle grade and YA nonfiction, fantasy and science fiction, graphic novels, poetry. And the best part is that YOU (and me, all of us readers!) get to nominate our favorite books anytime between now and October 15. Anything you have read since last October. So head on over to the CYBILS WEBSITE NOW! Over the weekend, I finished LUCKY BREAKS, the sequel to HIGHER POWER OF LUCKY, by Susan Patron. If I had to sum the book up in one sentence, I think I'd say, "It's an absolutely perfect book for an eleven-year-old." The book opens with a celebration of age eleven. "Eleven, Lucky thought from her seat at the back of the school bus, eleven, eleven, eleven, and the idea of it, the sound of it, threw off sparks in her head. You start with one, two, three: those clunky one-syllable beginner-ages that toddlers play with. Keep going and you get to eight, nine, ten: the plodding steps you have to climb until at last, you arrive. Finally, finally you reach the best age, the one that, when you say it out loud, sounds like a little tap dance or a drumroll." (p. 1). (NOTE: This is just the first paragraph, there is actually another one that is equally beautifully written). Lucky is turning 11, and she desperately wants her eleventh year to be something special. The problem is, there is not a whole lot special going on in the town of Hard Pan. Her mother, Brigitte, is still running her little weekend cafe. Her best friend, Lincoln, is still tying knots. Miles, the resident five-year-old genius is making his way through BRAIN SURGERY FOR BEGINNERS. Everything is very ordinary until Paloma, another eleven-year-old girl, visits Hard Pan with a group of geologists. Lucky suddenly realizes that what she really wants, maybe even needs, is an eleven-year-old best friend that's a girl. This is a book about the quirkiness of families and living in community. It's a book about friendship, and about how friends, even good friends, sometimes have problems, and how they solve them, and forgive each other, and move on. It's a book about stupid, and yeah, even dangerous choices. LUCKY BREAKS is an absolutely perfect book for an eleven-year-old. Today is a very special day. 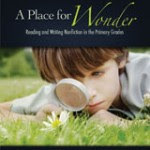 Today is the "book birthday" for Georgia Heard and Jennifer McDonough's terrific new professional book, A PLACE FOR WONDER: READING AND WRITING NONFICTION IN THE PRIMARY GRADES. Georgia Heard is a well-known poet (FALLING DOWN THE PAGE, THIS PLACE OF COMFORT, CREATURES OF LAND, SEA, AND SKY) and author of many professional books (THE REVISION TOOLBOX, AWAKENING THE HEART). Jennifer McDonough is a primary grade teacher in Florida. In A PLACE FOR WONDER, Heard and McDonough examine how teachers can create “landscapes of wonder,” classrooms where curiosity, creativity, and observation are encouraged, and where intelligent, inquiring, lifelong learners are developed. They provide teachers with practical ways – setting up “wonder centers,” gathering data through senses, teaching nonfiction craft – to create classroom environments where students’ questions and observations are part of daily work. You can preview the entire book online here. Heard and McDonough will go "on tour," well, ok a blog tour, later in October. As an added bonus, Stenhouse will wrap up the blog tour with a LIVE WEBCAST with Georgia and Jennifer on Oct. 26th at 8 p.m. EST. This will be a great opportunity to join a small group discussion with the two authors. Five participants for this live webcast will be chosen from the comments in this post and the blog tour post on October 23 If you would like to have your name thrown in the bowl, post a comment or question about the book here. Include your email address so I can contact you if you win! No special software or equipment are needed to participate in the webcast – just a phone and your computer. From now until the beginning of the tour you can also receive free shipping when you order A Place for Wonder. Just use code “blog” at the checkout when you order from www.stenhouse.com or by phone at 800-988-9812. The book starts shipping today! Late September. Five-year-old D sits at my round table, pencil clutched in chubby fingers. "Do you know how to write your name?" I ask. "Nope, not yet," D says happily. "But I do know how to make circles. Wanna see?" Without waiting for an answer, D sets off on a circle making adventure. He hasn't quite learned to hold a pencil, and his marks are light and barely legible. The circles are decidedly lopsided. Some touch each other and overlap. D, however, is unconcerned. "Hey," he exclaims. "Look. That one looks like a fish." As the person responsible for overseeing literacy in my building. I should be a little bit concerned. According to state law, in eight short months, D must be able to write not only his first, but also his last name. He must recognize all 26 upper and lowercase letters and know ten sight words. He has to read a book with three lines of text, variations in pattern, and a little dialogue. And right now, D's greatest literary accomplishment is drawing circles that look like fish. Even so, I find myself more than a little taken with this little guy. He is not concerned that he can't write his name. He can draw circles. And amazingly, some of the circles even turn out looking like fish! There are lots of possibilities out there. The operative word here appears to be yet. D can't write his name yet. D doesn't know too many letters yet. D can't read books with three lines of text yet. But right now, today, he's learning to hold a pencil. And he can draw circles, albeit a little lopsided. And I know from watching him in the classroom that he can read a little and that he loves books like NO DAVID. It's all in the yet factor. As his teacher, I just gotta remember to view D in terms of yet. "Sangoel's father was killed in the war in Sudan. His family had to run from the fighting in the middle of the night. Sangoel was a refuge. He did not have a home. He did not have a country…"
Eight-year-old Sangoel, his little sister Lili, and his mother travel in a "skyboat" to the United States. Everything is strange. The stairs in the airport move and Mama is afraid to step on them. The family does not know how to cross streets. They have to learn how to cook on the stove, eat with forks, and use the telephone. Sangoel sleeps on the floor next to his bed every night. Hardest of all, though, is the loneliness. No one- not his teachers, not his soccer coach, nor his peers- even knows how to pronounce his name correctly. Sangoel tells his mother, "In America I have lost my name." His mother wonders whether he should take an American name. Sangoel, however, remembers the words of the Wise One in the refuge camps, "You carry a Dinka name. It is the name of your father and his ancestors before him." On his own, he figures out a way to teach people how to pronounce his name. This year at my school, we have an extraordinary large number of immigrant children. We have always had many children from Mexico. This year,we have Falastin, who came from Somalia only a few days before school started, and speaks very, very, very little English. Manar is from Iraq. Glory, N'dago, Hawa, Amadou, and Patrick are from other countries in Africa. 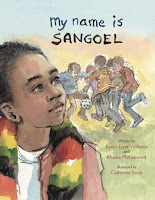 My kids need to read MY NAME IS SANGOEL. It will help them understand how it feels to be so new and alone. I think it will grow their hearts. And that, in my mind, is one of the main reasons for reading. • Atwell talks about creating "passionate, skillful, habitual readers." I love her language. That's exactly my goal for readers. Passionate. Skillful. Habitual. Yep! 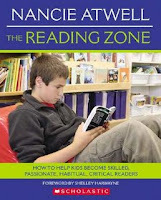 • Atwell describes the reading workshop as a "deliberate environment." The conditions are thoughtful and carefully created. It's a time when kids are completely engaged and fully focused on their books. Kids work very hard during this time. 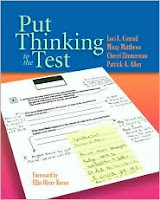 • Atwell believes the teacher has a huge and important role in the reading workshop. The teacher is the person who invites, nurtures, and sustains her students love of literature. She is, first and foremost, a reader. She reads tons and tons and tons of books, so that she is always ready to put the right book in the right child's hands. Donalyn Miller describes the teacher as "a book whisperer." That's exactly the person want to be in the lives of my students. • Atwell talks about the need for frequent and voluminous reading. She cites Malcolm Gladwell, who says people need 10,000 hours of practice to get good at something. Far too often, I think, there is so much going on during the literacy block-- work stations, ELL, interventions. Those are all good and important things, but they are not reading. Many kids don't get the time they need to just read and get better at. Unfortunately, the more time kids need, the less they often get. • Atwell points out that people who read don't just get smarter about book and words, they get smarter about ideas, history, people, and places. Nancie works in Edgecombe, Maine, a little tiny rural town. Many of her students have the same issues with background knowledge that our inner city Denver kids have. Books open worlds that our kids may never see otherwise. • Atwell talks about the role of the classics in people's reading lives. She says, "A non reader confronted by a book like Jane Eyre doesn’t stand a chance." I see that in the lives of my own sons. The English curriculum at their school is heavy on classics. Last year Son #1 read TO KILL A MOCKINGBIRD, CATCHER IN THE RYE and ROMEO AND JULIET. His teacher, who I adore, did a terrific job making the books real for his students- they watched videos of the books and others that were related, Gregg read aloud to his students, they drew, and acted, and wrote. For the most part, I'm glad Zay read these books, especially TO KILL A MOCKINGBIRD, which is one of my all-time favorite books. But Zay needed lots and lots and lots of support to make any sense out of these "classic books." 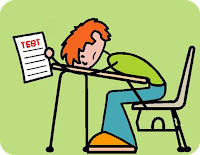 I worry about kids in classrooms where the teacher doesn't provide support beyond a list of comprehension questions or essay topics. • I really question the value and relevance of some of this reading. I'm not sure a book like CATCHER IN THE RYE, about a wealthy, Anglo boy growing up in an East Coast prep school had much relevance or truth for my son. If the point was to have kids read a COMING OF AGE novel, I wonder why there couldn't be a presentation on coming of age novels, followed by a list of twenty, and kids could choose two or three, and compare them. Wouldn't that be an equally valuable experience? Or could they read sections of CATCHER IN THE RYE, and compare those to their own lives? • Atwell further points out that many of the classics are books that were written for adult audiences. They are books with adult protagonists. They are better understood and appreciated by adults, or at least by kids who have had a lot of experience with lots of other texts first. • Adults who are literary, habitual readers got that way not by reading the classics as children, but rather by reading stuff with less "literary value," series like Nancy Drew, the Hardy Boys, and authors like Judy Blume. That voluminous reading gave them the strategies and background knowledge about literature and about life that would later enable them to be successful in handling the classics. Atwell closes by saying, "Our job as reading teachers is to invite kids to enter that happy state of engagement again and again and again and to help them stay there." If I can do that for kids, every day, or even most days, then I think I've done my job. Thanks Nancie, for your fabulous response! Martha is a spunky little otter, kind of a cross between Ian Falconer's Olivia and Kevin Henkes' Lily. On one particularly rough day, she spills cake batter on her mother, paints her father's back red, and wakes her baby brother during nap time. Sent to time out, she stubbornly refuses to apologize. She changes her tune, however, when she realizes that people who don't apologize don't get cookies from their mothers, or piggyback rides from their dads, or hugs from their baby brothers. I love everything about Martha- her pink dress with the Peter Pan collar and headband, her spunky attitude, and her stubborn streak. The illustrations are lots of fun- I especially love the one where Martha is reading HARRY OTTER! 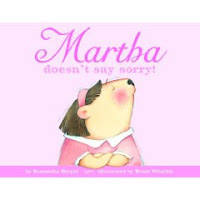 I know kids are going to flat out love the story, but I also know the book is going to lead to great discussions about how we treat each other, and why it's important to apologize when you make a mistake. Can't wait to share this new find with kids! OK, I gotta admit it- I'm a book pusher. There's nothing I like better than matching the right book with the right kid. And I'm pretty good at it. I think I met my match this weekend, though. Mr. Al Foxword is the consummate salesman- he can sell ANYTHING- even ice to the penguin. Faced with the challenge of selling books to people who don't like to read, though, he has to work extra hard. This is a really fun new read by Melanie Watt, the author of SCAREDY SQUIRREL. I've been talking to my teachers about engagement and motivation, and helping kids choose "just right books." I can't wait to share HAVE I GOT A BOOK FOR YOU with teachers and kids this week. Today I'm privileged to be a part of the blog tour for WAKING ANASTASIA, the debut novel by 2K9 author (and high school teacher! ), Joy Preble. This is terrific read. There are so many layers, so many ways readers could enter into this book. First, it's just a fun page-turner, with a hint of romance, a little teen age drama, and lots and lots of action. Second, it's a novel that will send kids off on journeys into Russian history and folklore-- I found myself wanting to know more about the Romanovs, and more about Baba Yaga and her hut in the woods. Finally, those literary and writerly types will want to read and reread to study how Preble uses Anne, Ethan, and Anastasia as alternating voices in different chapters, how she moves from setting, how she transitions in and out of dream sequences, and how she weaves Russian folklore and history throughout the book (the book kind of reminded me of SNOW IN AUGUST, one of my adult favorites). Wow, wow, wow! For an interview of Preble, visit Shelf Elf. For a book giveaway, check out Presenting Lenore, and for a really fun interview of Ethan and Anne, go to The Shady Glade. You might also want to visit Joy's blog to see pictures of yesterday's book launch and signing at her local bookstore. Another Colorado teacher, Patrick Allen, has just started a blog, All-en-A-Days-Work (Did you notice the clever title??). Patrick currently teaches third grade, is a long-time staff developer for the Public Education and Business Coalition and is one of the authors of PUT THINKING TO THE TEST. His latest book, CONFERRING: THE KEYSTONE OF READERS' WORKSHOP, will be published in November by Stenhouse Publishers. He just started blogging this week and already has a couple of fabulous posts! Stop by and welcome him to the world of kidlitosphere. Earlier this week, A. was in my room, in a group who was working with Ms. H,the ESL teacher (she and I share a classroom). I was on the other side of the room giving DRA's. Ms. H., was meeting with the group for the first time, and was explaining to the children that they were all members of Team ESL, and that they would have the opportunity to earn team points, which could then be traded for a game day or cooking activity. Ms. H. said, "When you earn enough points, we will do a cooking activity, a cooking and learning activity, a nutritious cooking and learning activity." Without moment's hesitation, A turned to me, "Hey," he shouted across the room, "that's just like Mo Willems!" Everyone else was a little confused, but I knew exactly what A was talking about. In Mo Willem's, "I Am Invited to a Party," one of the main characters (I think it's Piggy, but it might be Gerald the Elephant) is invited to a party. She has never been to a party before, and is concerned about what to wear, so Gerald volunteers to help Piggy prepare. First, Piggy and Gerald prepare for a fancy party, then they are worried that it might be a fancy costume party, so they add a costume to their fancy dress. Next, the two animals are concerned that the party might be a fancy costume swimming party, so they put on their flippers and snorkels, along with everything else. When Ms. H. says they will have a cooking activity, then a cooking and learning activity, then a nutritious cooking and learning activity, her cumulative sentence pattern reminds A of Mo Willem's cumulative fancy costume swimming party. Pretty smart, I think, for a child who has only been speaking English for a couple of years. Lots of people are concerned about A. I'm not. A has the heart of a reader. He has a favorite author. He is making the text to life connections that readers make. He is beginning to own the language patterns he finds in books. Yeah, A, has a way to go as a reader, but he's on his way. The other pieces will fall into place eventually. My dad loved football. 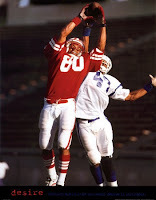 He played in high school and college, and was an ardent fan his whole life. He had season tickets to the Air Force Academy games, and each Saturday, he'd pack up his cooler and he and my mom, or he and his buddies, or sometimes he and his daughters, would head out to the games. My dad died about ten years before I adopted my boys. Every week, I sit in the stands and watch my boys play football. I know my dad would have driven the 75 miles to be at be at every game. He would have loved watching Son #1 streak down the field and burst into the end zone. He would have loved Son #2's quiet confidence as he manages the offense. He would have been so, so proud of his grandsons. is empty and full at once. A VERY, VERY long night helping my son create a brochure for his biology class. Being a parent, and especially the parent of a different kind of learner, sure gives you a whole different perspective on homework, projects, etc. We're almost two weeks into school, and reading workshops are in full swing. I've spent lots of time in classrooms talking to kids about just-right books. This fall, though, I'm approaching the whole "just-right" book thing a little differently. I'm spending lots and lots and lots of time talking about how people choose books they love, and book talking books I love, and just a little time talking about how you know if a book is just-right in terms of being something a person is actually able to read. I'm not spending nearly as much time talking about books that are too hard. 1) You enjoy reading the book. You are glad to pick it up. You don't want to quit reading when the timer goes off (at this point in the year we are still setting a timer for independent reading). You want to take the book home and read some more. 2) It might be a book by an author you love. 3) It might be a book in a series you love. 4) It might be a book a friend recommended. 5) It might be a subject you want to learn more about. 6) You can read most of the words on each page. 7) You have pictures in your head while you are reading. 8) You can hear the characters' voices while you are reading. 9) Sometimes you "talk" to the characters while you are reading. 10) You know what the book is about. 11) You can talk to friends about the book. The longer I teach, the more I think that a teacher's most important job is to put a just-right book into every single kid's hands. I'm working hard at doing that this year.